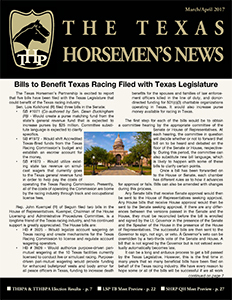 (Austin, Texas - Thursday, March 30, 2017) - On March 30, the March/April 2017 issue of The Texas Horsemen's News, the official publication of the Texas Horsemen's Partnership (THP), was distributed electronically to the THP's email list. If you are not already on the THP mailing list, be sure to sign up today. Shortly after signing up, you will receive an email with a link showing where you can download your copy of the March/April issue.